Furnace Installation Residential & Commercial Furnace Installation in Dearborn Heights! At Reckingers Heating and Cooling, we know the hassle of being without heat or hot water! That's why we properly install and maintain your system! We also offer emergency service and guarantees and for many types of projects. 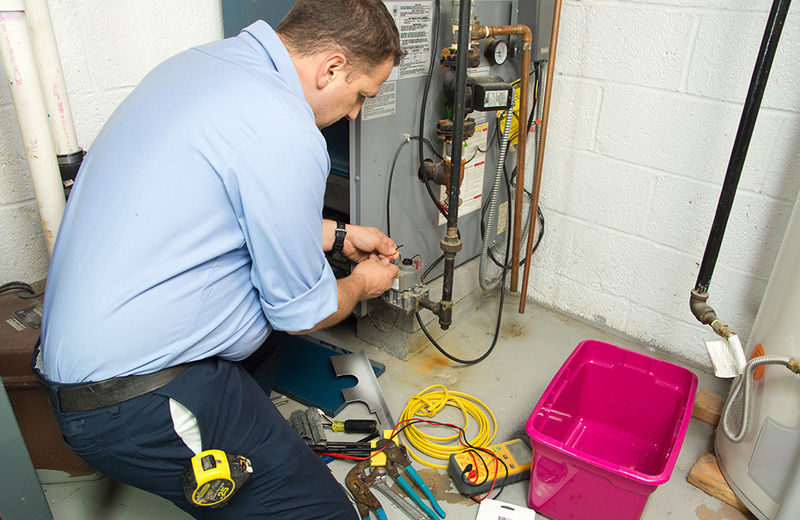 Why Furnace Installation for Your Home? Throughout our area of service -- Southeast Michigan and the larger Metro Detroit area, the large majority of homes and businesses periodically install a new system. Our team is dedicated to keeping you and your family comfortable with expert installation and repair services for all makes and models. We have the parts and knowledge you need to get your up-and-running. While we offer boiler and heat pump service options, new installations are popular service requests at our customer's homes. Efficiency. The cost of electric energy throughout the area is usually much higher than natural gas, which makes furnace installation a economical option. An investment that pays dividends. They are durable and, with routine service, will last for decades. High-efficiency system will save on utility bills and increase the value of your home. What Type of Furnace Installation is Right for My Home? There are a few rules for choosing the right system. The most important things you need to check are capacity, AFUE and brand. The right size: The capacity has to be proportioned to the size of your home or business, to obtain the best cost/efficiency ratio. The right features: The system you select should have the right features to both create comfort and energy-efficency. Some features include zoned heating, filtration system, variable heat output, variable speed blower, dual heat exchanger and more. The right brand: There are many brands to choose from. Some provide better efficiency, affordability, while others are more durable. At Reckingers, based on our long experience of servicing and working with major brands, we found the Trane brand to be best suited for the majority of our clients' needs. Trane systems are solidly built, long-lasting and typically require less maintenance. The right efficiency: The annual fuel utilization efficiency (AFUE) rating is a vital consideration when making your decision. A system with a high AFUE ratio will be more efficient and result in utility bill savings. The right cost: You should consider not just the price of your furnace installation, but the cost of installation, as it can vary between brands and models. Also consider energy savings from increased efficiency. Is it Time to Get a Furnace Installation? If you have a system that's 10 years or older, you should consider replacement. Systems now consume a lot less energy than older models, so a new one will save you on your energy bills.